Auto maker Mahindra and Mahindra has been sued by an Atlanta-based company, Global Vehicles, for the Indian company's delay in launching its pick-up truck. Global Vehicles, which had entered into an exclusive agreement to sell Mahindra's pick-up trucks in the US, in a law suit filed before an Atlanta District Court, alleged that there has been inordinate delay in launch of the truck. In its law suit filed on June 14, Global Vehicles said that it spent close to $35 million in preparation for the launch of the Mahindra vehicles in the US and had signed with as many as 360 dealers nationwide. This also includes an initial distribution appointment fee of $8.5 million. Global Vehicles, in its lawsuit, also said that the US dealers have spent more than $60 million in franchisee fees for the right to sell Mahindra vehicles. Mahindra, which was initially planning to launch its pick-up trucks -- the first by an Indian company -- in early 2009, now has scheduled its launch in the US market later this year. Global Vehicles has also initiated arbitration proceedings against Mahindra. In its law suit, Global Vehicles has urged the court to prevent Mahindra from selling its vehicles through any other dealer or distributor. 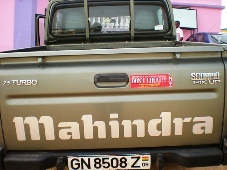 Mahindra and Mahindra and Global Vehicles had entered into an agreement on September 28, 2006, according to which the latter became the sole distributor of the Indian company's motor vehicles in the US.